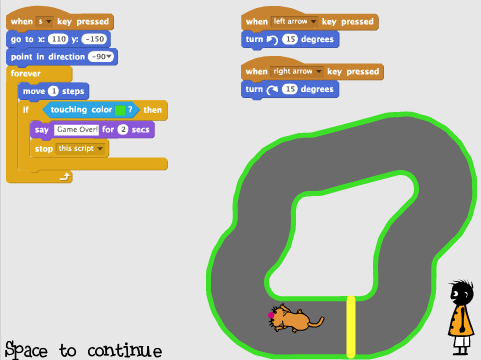 This is a handout for a roughly 3-hour course that teaches children starting from age 10 how to program a racing game in Scratch (no prerequisites). Ideally, the teacher first presents the individual steps (10-15 minutes) and then helps the children in doing it themselves. The handout contains extra material for fast learners who are done with the regular game quickly. This course requires the teacher to make him- or herself familiar with Scratch and in particular the commands needed for the racing game. There is an accompanying online tutorial that the teacher can use to make him- or herself familiar with the course. Links to Scratch projects containing the racing game (regular plus extended version) are given below and can be used as a template for the 15-20 minute presentation.